These aluminum air vents by Classic Grilles are offered in a painted brown, white or black finish. If left bare, the decorative wall registers will be coated in a protective clear finish to prevent oxidation of the aluminum. Use your aluminum air vents in the bathroom or kitchen since the aluminum faceplate will not rust around moisture! Each of the decorative wall registers are made out of a sand cast and are assembled by hand. American made aluminum air vents are made to order, offering each customer a unique and one of a kind register. Our Grape Leaf decorative wall registers features a vineyard design that is perfect for wine lovers. The decorative wall registers can be mounted into the ceiling as well since screws and pre drilled holes are provided with each order. The aluminum air vent faceplate is 1/4" thick and will measure slightly larger than the listed sizes below. All of the decorative wall registers are equipped with a metal diffuser which will open and close, allowing you full air control! 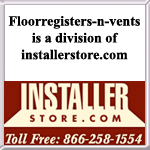 Tip: Our aluminum air vent is listed by the measurement of the actual hole opening of your duct unit. The 14 x 8 decorative wall registers will fit into a hole opening of 14 x 8 inches. For installation purposes, the faceplate will have an additional 2 inches added. Overall sizing can vary since these are sand cast to order. Important: These aluminum air vents are made to order. They can take between 7 to 9 weeks to ship out once payment has been received. The Grape Leaf decorative wall registers are non returnable, special items that cannot be canceled once order is placed. 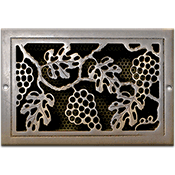 Purchase an aluminum air vent cover in the Grapevine pattern which does not have a damper for you cold air needs. If interested in decorative wall registers in other designs, Classic Grilles has seven others to choose from. Order your Grapevine aluminum air vent to give your home a chic and pleasing look while hiding old duct work.